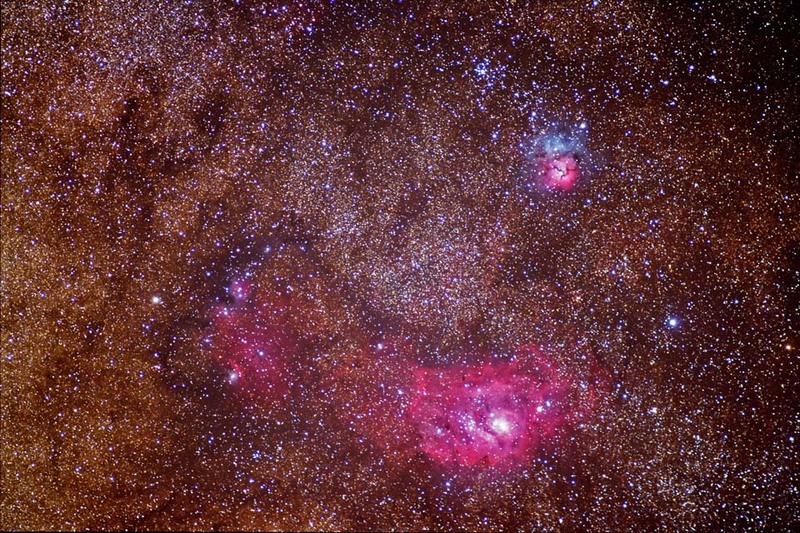 M8 (the Lagoon Nebula) and M20 ( the Trifid Nebula) occupy a very rich region in Sagittarius. There are many star-forming areas in this section of the Milky Way. Some less popuar nebulae in the center left part of the image include NGC6559, IC1274, IC1275, and IC4685. Camera was focused using Live View. Raw images were converted using Canon's Zoom Browser EX. Converted images were calibrated, aligned and combined with ImagesPlus. The f/8 and f/2.8 sets of images were processed separately. These images were stacked in Photoshop and a layer mask was applied to reveal the finer detail in the f/8 image. The final image was adjusted in Photoshop.